Immunofluorescence assay and immuno-electron microscopy to localize PfClpP. 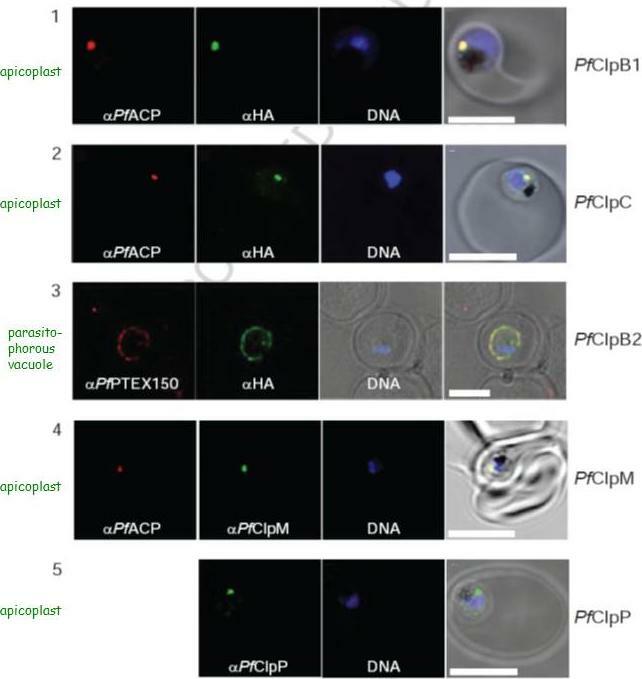 (A) Transgenic parasites expressing PfClpP-N-GFP were immuno-stained with antibodies specific to the apicoplast localized acyl carrier protein (ACP PFB0385w) (red). The parasite nuclei were stained with DAPI (blue) and slides were visualized by confocal laser scanning microscope. 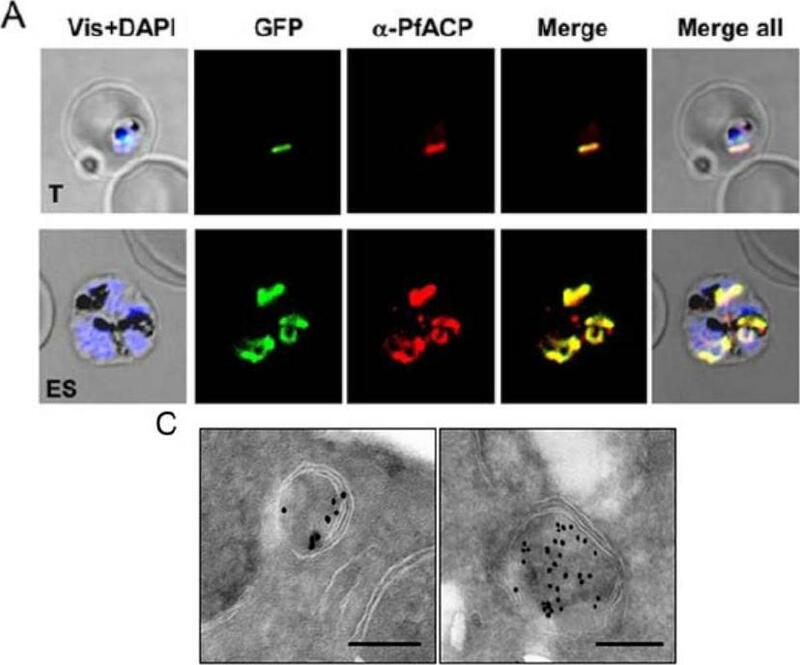 The PfClpP-N-GFP fusion protein and ACP were colocalized in the parasite apicoplast. (C) Localization of PfClpP by immuno-electron microscopy. Ultra thin sections of transgenic P. falciparum parasites expressing PfClpP-N-GFP were labeled with anti-GFP antibody and gold labeled secondary antibody. Labeling was observed in the apicoplast having characteristic four membranes. Scale bar = 250nm. Rathore S, Sinha D, Asad M, Böttcher T, Afreen F, Chauhan VS, Gupta D, Sieber S, Mohmmed A. 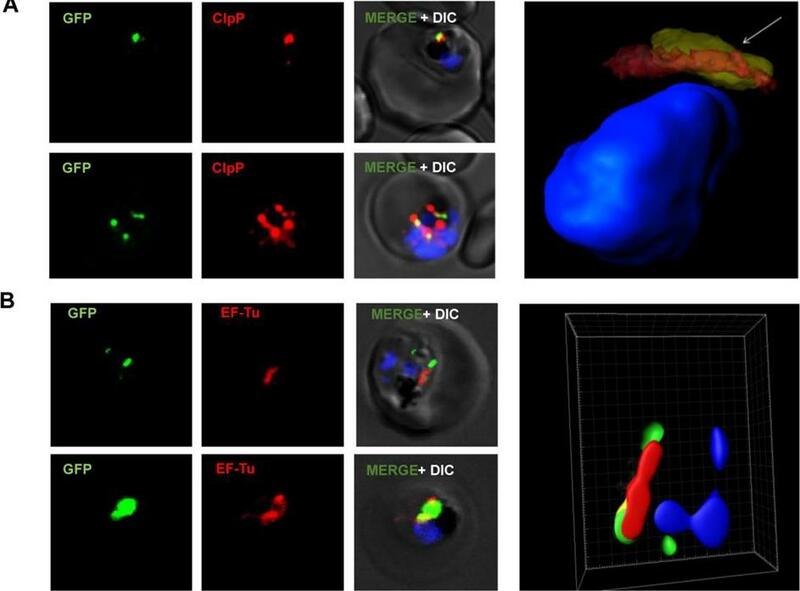 A cyanobacterial serine protease of Plasmodium falciparum is targeted to the apicoplast and plays important role in its growth and development. Mol Microbiol. 2010 ) 77: 873–890.